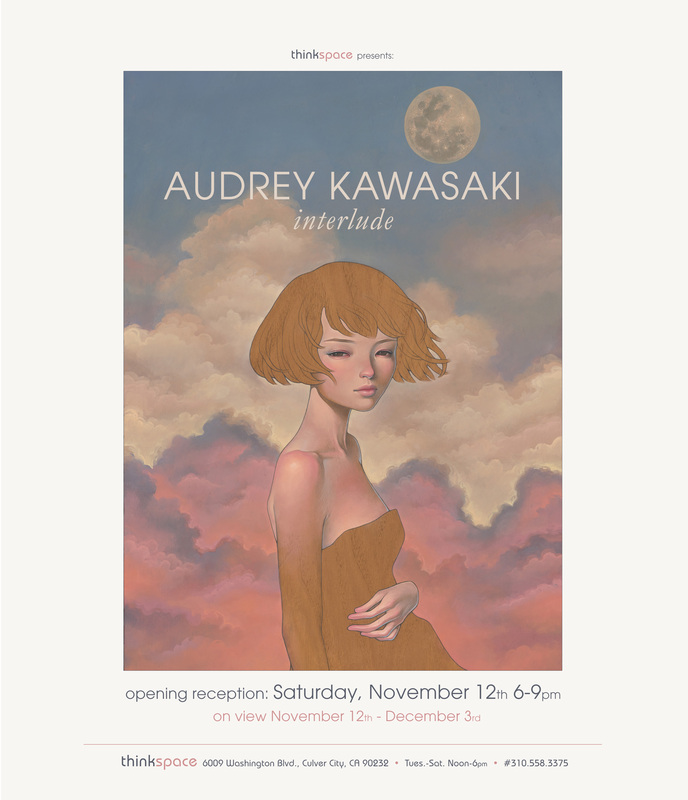 (Los Angeles, CA ) – Thinkspace is pleased to present new works by Audrey Kawasaki in Interlude. This highly anticipated exhibition is her first with the gallery in LA since 2011. Based in Los Angeles, the Japanese-American painter is known for her erotically charged figurative works and the consistency of her highly sought after style. She chases a ghostly and forever evasive muse, always in search of the same cagey persona. Reinvented endlessly through mutable guises and incarnations, Kawasaki pulls “her” from beneath and within the surface of panel in what can only be described as an exorcism or a labor of love. Born in Los Angeles to Japanese parents, Kawasaki grew up drawn between two worlds, immersed in Japanese culture while growing up in America. As a result, her childhood experience was divided in some ways, informing a sensibility that permeates her work still in its unique combination of Eastern and Western aesthetics. She grew up with manga comics, which ultimately inspired her to draw, and anime, and lists them still among her influences. Her illustrative style and preference for clean line work are equally informed by a love of European Art Nouveau. The wide-eyed muse that guides her hand clearly draws from both figurative traditions, while her use of ornate graphic motifs, organic imagery, and curvilinear lines feels indebted to the likes of Mucha and Klimt, also among her inspirations. Despite these clear antecedents, her work combines them into a cohesive style that feels entirely unique and personal. Kawasaki’s paintings are firmly rooted in drawing. She begins each work with pencil on wood panel, her preferred ground for its organic warmth and natural inconsistencies. Once the drawing is complete and sealed with a gel medium, she coaxes the figure to the surface, bringing it to life gradually with multiple layers of oil paint. A perfectionist with a penchant for luminous and translucent skins and gradient color transitions, the paintings, and the fugitive within them, reveal their debt to process. With a preference for muted palettes, though she has recently experimented with bolder hues, Kawasaki uses the panel as an element in her compositions, allowing the grain to show through the pellucid paint. The undeniable eroticism of Kawasaki’s works has garnered some controversy given the precocious innocence and ambiguously ageless quality of her ghost. The figure Kawasaki tirelessly chases, however, is inextricably linked to the satisfaction of personal fiction. Though not an alter-ego per se, “she” is an expression of the artist’s freedom and a grounds for fantasy and desire, exempt from the reality of social constraints. She is bold, at times vulgar, and at others vulnerable, a vehicle through which Kawasaki has explored feminine expressions of sexuality. The coexistence of contradictory elements is central to the staying power of Kawasaki’s scintillating universe. 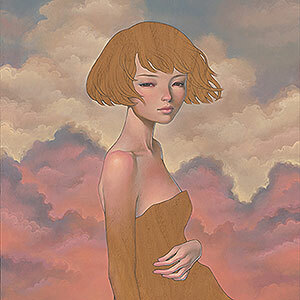 Graphic yet ethereal, her paintings are innocent and dark, hopeful and morbid, controlled and ecstatic. Like any good haunting, the ghost refuses to relent.